Shackle bolt in shank or chain? Attachment 49365I have always thought that the bolt/pin should go through the hole or slot at the end of the anchor shank and the loop or eye of the shackle gets attached to the line, thimble or last chain link. But many anchors have a slotted hole that is long enough to pass one of or either of the bolt/pin eyes w the eye going sideways through the slotted hole at the end of the anchor shank. Looks like the slot was intended for this purpose .. as I see no other possible reason for the anchor shank attach hole to be an elongated hole. But I see knowledgeable TF members attaching the rode to the anchor w the pin through anchor shank and others w the hoop or eye through the shank. On my float where we moor our boat about 60% put the pin through the shank and 40% attach the rode at the pin and the hoop through the shank. I always put the pin through the shank but there's a bit of doubt that this is correct. Fly stuff many will say ... but what is correct? Pin thru the chain, shackle thru the anchor is what I do. I want the largest shackle I can get to fit both anchor and chain. So I match pin to anchor and fit biggest pin I can. depending, I too would say pin through chain and round part in anchor...there should be no way for the anchor tackle to change 90 degrees and exert an uneven force on the shackle...it should all rotate with pull on the chain. Bow shackle through the anchor slot, pin through the chain. I think that's the Sarca recommendation too. Does it make a difference which way you assemble it? Why? No way will my shackle go through the hole in the shaft of the anchor, so no choice. Unless one way allows you to use a larger shackle. No, absolutely not Brian, except probably not all that important if it is an Excel with no tripping slot, or any other anchor just about, but for the Super Sarca with slot, it must be a U shackle (not bow), with pin through the shank, not the chain. Leaving aside the specific tripping slot issue, I would still have favoured the pin through the anchor shank, so one can fit a nice big one, also so the surfaces are more like on like, i.e. the curved part of the shackle meeting curved chain, and wider and squarer dimensions of the slot marrying up with the straight pin of the shackle, so more surface area in contact Also, arguably, a smoother entry on approach to the roller assembly via the U shaped part coming in first...but it probably is no biggie apart from the slot issue, where is it important. Yes, Pete you are right for the Sarca, or for the Excel with the tripping slot. After it was too late to edit my post I saw that Rex says to use a conventional D-shackle on these anchors. By the way, how do you go with a tripping slot when the current reverses? Aren't you in danger of the anchor self-tripping then? Brian, my answer, after using it for about 10 years now, would be no, but keep an eye on Panope Steve's 'Anchor setting video' thread, because he is shortly, to demonstrate why this does not occur in hopefully vivid colour, just not 3D...or if it does, they reset so fast you don't notice it. Been busy w a huge birthday party so have been away. Sorry about the inverted pic .. my attempt posting a pic didn't go well. Still don't know why it is up-side-down. I'm not surprised at the results in this little thread in that opinions would be mixed and I took a stand right away stating my preference ... I shouldn't have. I should have been more open minded and objective. Some good observations were made by PeterB, .... actually everybody. The large shackle may have merit .. that being that the shackle may need to be larger to match the capacity of the chain. Are most shackles used weaker than the chain they are attached to? I thought about the side loads on the shackle and pin with the pin in the shank and the rode pulling sideways. Not only is the pin loaded in an undesirable way the side pull would tend to spread the "legs" of the shackle w big side loads. So keeping the pull "in line" w the rode very likely has benefits. Best point I think. Anchor Right Aus has reasons to put the pin to the shank for reasons not subject to this thread. But clearly an obvious recommendation from a manufacturer. Many many anchors come w a hole sized for a certain size pin such as my XYZ in the inverted photo above. No choice. What's so significant about this IMO is that many anchor manufacturers indicate that pin to the shank is best. That's what got me thinking about this in the first place. Pin through the shank to permit a big shackle is a very limited case as an advantage because the hole in the shank is IMO no larger than what the anchor manufacturer thinks is the size pin to use. Many times after selecting a shackle for an anchor I've found the hole is too small for the pin of the shackle I've chosen. The "surfaces are alike" holds much more weight I think. First of all if the shackle hoop in the slot in the shank than only extremely small metal to metal contact points will take the whole load in a tiny spot. Probably good for getting rid of some galvanizing so rust may be premature. I give Mike (GFC) thae last word in that it's obvious that even the anchor manufacturers are at odds w this so "what me worry? seems the most defendable position on this question. Note I did not say "this issue" as it obviously isn't. I still kinda like the pin to shank method but something new has occurred to me re the Hoop in the slot hookup. It appears that many anchor manufacturers seem to think the pin to the shank is preferable as they provide only the hole in the shank. And the slot on the shank seems to indicate the slot is there to allow the eyes of the shackle (that the pin goes through) to go through the slot so they must be supporting the slot and the slot is to pass the eye through. Well I now think the slot also allows the "hoop" of the shank to rotate in the slot and therefore keep the shackle aligned to the rode. Shackle alignment to the rode is obviously lost w the pin in the slot so I'm thinking the slot is there primarily to allow rotation of the hoop in the slot and the resulting alignment of the shank when the rode and shank may be quite far from alignment. So the hoop in the slot and the pin to the chain or other shackle may allow the shackle to have slightly heavier loads applied. So it can be viewed as stronger. One last observation. Shackles in stores called anchor shackles have a rather large "hoop" in the biggest part of the shackle. I present two pics .. the 2nd pic of the more common "anchor shackle" size and the first a large hoop anchor shackle that I believe came w the anchor. The shackle is almost a complete loop as it's bolted to the bottom of "U" of the sheetmetal channel. The open part of the channel is to the left in the pic. The second typical shackle is not (I'm quite sure) provided by the anchor manufacturer. I'm almost sure (99%) that the large circular hoop shackles are made as anchor shackles. I'm almost convinced the hoop is usually intended to attach to the rode w another shackle as seen in the 2nd pic. I took the first pic and the 2nd was from an anchor manufacturers literature. Large hole/hoop shackles are also used on cranes and many other applications having nothing to do w anchors. I'm with Pete. If you install the bow through the slot, the sharp corners of the slot will bear on the inner curve of the bow. Pin through the slot, bow through the chain gives you the most metal to metal contact. That said, it's probably not a big deal either way. Although the argument re the pin being in the slot might prevent such a straight line-up with the rode, and almost a twisting action on occasion, (actually this being the feature of the Sarca tripping slot that prevents it tripping when its not supposed to), let's be honest, who has ever had their pin pull out of the other side of the shackle in any situation. (I might place a rider there that this is assuming a decently large and high quality shackle in the first place). I guess if the anchor was securely and irretrievably fouled it might just happen at the extreme, but by that stage I think one might be glad to sacrifice the anchor and retain all the chain, don't yuh think..? Eric, not seeing any mousing on those shackles. With the Super Sarca, the pin will move along the slot better than the shackle end, effectively it becomes part of the anchor. I had to shop around for a good, rated, right sized shackle, a Ronstan as it turned out. To add to Peter`s experience, we`ve had many boat reversals due to wind and tide, without an unset, so far. Does the shackle on your SS look like the shackle in the pic in post #1? 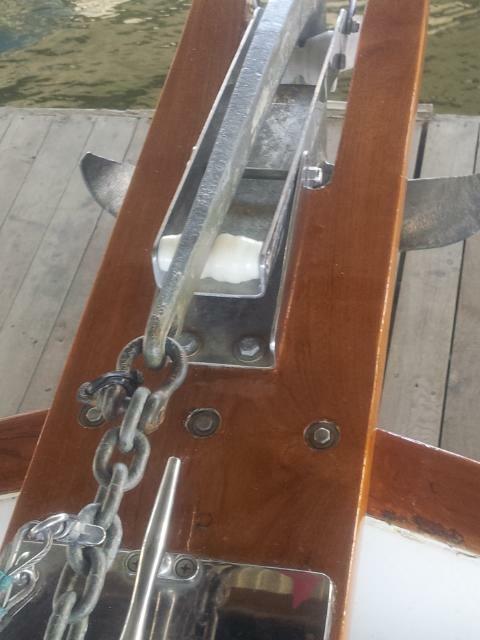 Re non-slip slot anchors the alignment of the shackle to the rode may have no benifit whatsoever. There are small benefits that can be identified ... primarily the ability to fit the anchor hole or slot and the ability for the shackle to fit the chain. I still prefer the pin in the shank however I started this thread to see if there is a correct or more correct attachment. One thing I don't remember mentioning is that larger shackle may inhibit penetration of the shank end. I've noticed in anchor setting vids that the shank frequently plunges into the bottom. Eric, the pin is in the slot. The anchor in #1 has no sliding slot, but except for that, yes. From memory without reviewing the S/Sarca set videos,the S/S did not bury the end of the shank when set. If you are using HT chain, I don't see how you can get anything but the pin through the link in the chain unless you have oversize links. With the shackles I have used, an appropriate size shackle will not fit through the the link on HT chain. You mean the small eye that the pin goes through or the pin itself through the end chain link? If that "With the shackles I have used, an appropriate size shackle will not fit through the the link on HT chain" is true either a 2nd shackle must be used or the "pin in the shank" is the only option. Now if that is true of non-HT chain the pin in the shank would seem to be the standard method. But the shackle end fit easily through the hole in my anchor.